Pleasant Ridge has the wonderful distinction of two business districts, the classic one that spans Montgomery Road and the convenient one on Ridge at I-71. You'll find your basic needs met at Pleasant Ridge Hardware, the extremely helpful Mullaney's Pharmacy, three banks and a variety of little shops along Montgomery. The expressway collection includes Value City (for incredible clothing deals) and Bigg's (groceries with one of the city's best Kosher food sections), as well as a good representation of standard expressway exit ventures like Target, Meijer, Lowe's, Home Depot, Office Depot, Sam's Club and Walmart. 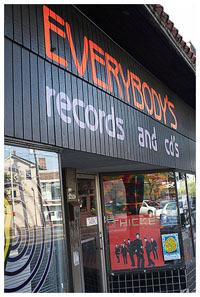 For unique shopping, collectors gravitate to: Everybody's Records (THE premier spot in the city for used vinyl), Queen City Comics (including character collectibles), Earth Collectible Toy Mall (a huge array of vintage toys and games) and Brass Eagle Antiques (specializing in fine glass and table wear with some Rookwood pottery gently placed in the mix).